Sometimes it rains here. A lot—although it should be the dry season now. 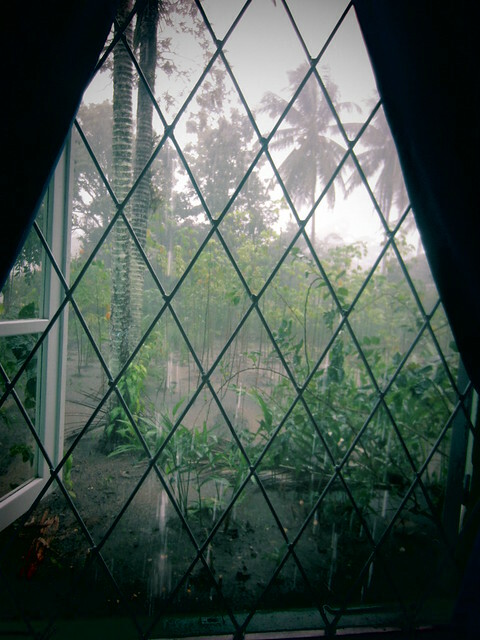 This was a rainstorm on Monday 9 July 2012, seen from the cozy room of the deaconess building in Siantar. I am no stranger to soft rain, but this rain—a rain that can last for hours and brings with it a loud rush as it hits rooftops and earth—is an incredible sight. Sometimes the rainstorm comes during the day, and we sit under the protection of a building, waiting for it to stop. Sometimes the rain comes at night, and I lay in bed listening to the beats of heavy raindrops on the roof and plants below and the cracks and booms of thunder, grateful for dry shelter. Whatever the time of day, I am in yet awe of this common weather phenomenon.